Stewart Nickel is well aware of the ups and downs of racehorse ownership, and he experienced them yet again this year with the mare Daylight Ahead. But as the 2018 MATCH Series concludes, Nickel and his partners ended up with a pleasant surprise. 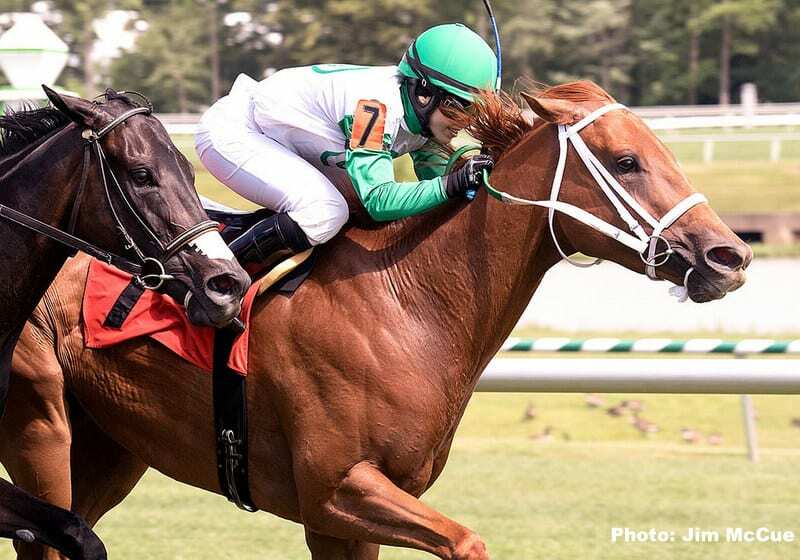 Daylight Ahead, bred and owned by Winners Circle Partners VIII, got some time off after her 4-year-old season and was pointed to the Filly and Mare Sprint—Turf Division, which kicked off Preakness Stakes weekend at Pimlico Race Course. But The Very One Stakes was switched from turf to dirt after days of heavy rain, and Daylight Ahead checked in sixth after a troubled trip. The 5-year-old Maryland-bred mare then raced in the Penn Ladies Dash, second leg of the division, and finished eighth. That left her with 2 points in the MATCH Series, and after a few even finishes in allowance races at Laurel, Nickel and trainer Hugh McMahon weren't sure how to proceed. Things may not have gone according to plan for Daylight Ahead, but that could be said for the Filly and Mare Sprint—Division. Several horses with a good number of points fell by the wayside, and the division leader, Smiling Causeway, was expected to pass on the $100,000 Sensible Lady Turf Dash Sept. 15 at Laurel Park and miss a third division start that would have qualified her for bonus money. That left Daylight Ahead in need of one more start to win the division ($20,000 to the owner and $15,000 to the trainer)—perhaps with only 3 points. But when the Sept. 15 stakes program was moved to Sept. 22 because of a very wet grass course and the threat of three inches of rain from Hurricane Florence, nominations were re-opened and Smiling Causeway was among them. Smiling Causeway, owned by Audley Farm Stable and bred by Arnaud Delacour, will enter the Sensible Lady with 12 MATCH Series points. At a minimum, she will pick up 1 point for starting in the six-furlong race. Daylight Ahead has 2 points, and even a victory would only give her 12; no matter the result, she will win $15,000 for her owner and $10,000 for her trainer for finishing second in the division. Winners Circle Partners VIII, one of the breed-to-race partnerships Nickel, a lifelong Maryland resident, has put together over the years, has about 15 members. They claimed and owned the mare Seeking Options, who won several races for the group before being retired and bred. She was bred to Mineshaft and produced Daylight Ahead, who has earned more than $207,000 in 19 starts. There is added financial benefit for Winners Circle given breeder bonuses offered by various regional organizations in conjunction with the MATCH Series. And with a start in the Sensible Lady, Daylight Ahead will be the only horse in the series to win two of the bonuses. As a Maryland-bred, she will earn $5,000 from the Maryland Horse Breeders Association for the top filly or mare by overall points. She also is Delaware Certified—she spent at least 90 days prior to March 31 of her 2-year-old year at a registered Delaware farm—and thus will earn another $5,000 from the Delaware Certified Thoroughbred Program as the top filly or mare by MATCH points among Certified participants. So that's a total of $35,000 in bonus money for Daylight Ahead's connections despite a difficult season. This entry was posted in NL List, People and tagged Daylight Ahead, laurel park, Maryland racing, match series, thoroughbred owners, Tom LaMarra by MATCH Series Release. Bookmark the permalink.